What Does a File Clerk Do? File clerks maintain order and control over written records and documents, including correspondence and invoices. They sometimes also organize and maintain electronic data, although other employees might take care of this on their own without the need for outside assistance. In either case, the job entails using a prescribed system, either numerical or alphabetical, to ensure that information can be quickly located when it's needed. Approximately 135,000 file clerks were employed in the U.S. in 2016. They work in healthcare, social services, and in various professional offices, such as law firms—basically any business that generates a lot of paperwork and documents. Develop and maintain organized file systems. Create, process and maintain file records. File and retrieve documents for other personnel. Prepare records for off-site storage. Maintain file room logs to track the location of files throughout the business. Dispose of files in accordance with established document retention schedules. This is often an entry-level position and the pay reflects that. Educational standards are not high for this profession, and most training occurs on the job. Education: A high school diploma or its equivalent is typically necessary, although some working in these positions have college and advanced degrees. About 11% have post-secondary school certificates. Training: Some work experience in a similar field can be very helpful. On-the-job training usually involves working under a more experienced clerk for three to 12 months. Reading comprehension: A good bit of this position involves deriving a document's nature from its contents to place it in a location where it's logical that others will look for it. Listening skills: This is important to understanding coworkers' needs and to implementing their suggestions. 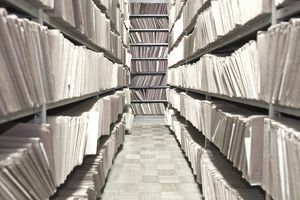 Critical-thinking skills: Logic and decision-making skills can be key to expeditiously sorting through various documents and determining what to do with them. File clerks don't have a particularly bright career outlook. This profession is expected to decline by about 2% from 2016 through 2026. Technological data storage is growing in capability and use, effectively making human file clerks obsolete. As a file clerk, you will gain an inside look at how a law firm records department operates. You will also have the opportunity to meet and interact with many levels of law firm personnel. These jobs typically move in tandem with regular office hours. When an office is open to clients and other personnel are present, a file clerk is expected to be available. Additionally, the amount of documentation produced can be significant depending on the size and nature of the firm or business. File clerks might have to work full-time to keep up with the flow, but this isn't to say that part-time jobs aren't available. Overtime is not normally required. Similar jobs are available in fields other than the typical professional office scenario. These are a few, along with their median annual pay as of 2017. Many require more extensive education and training, however. Do You Have What It Takes to Be a Court Clerk?